Saggy cheeks and eyelids, sallow looking skin, pronounced cellulite, thinning hair or even loss of hair – those are just some examples for unpleasant changes of an aging face and body. Are these unavoidable signs of aging or do these changes of the body possibly have other reasons? Unfortunately or rather luckily it is not possible to stop time and to spend life in eternal youth. However, premature or especially distinctive aging processes may be triggered by lifestyle, burdening circumstances, or illness. If the body is suffering from deficiency symptoms due to chronic stress or illness, the skin’s biological quality and elasticity are decreasing and the underlying tissue, the muscles, and other body structures are degenerating. 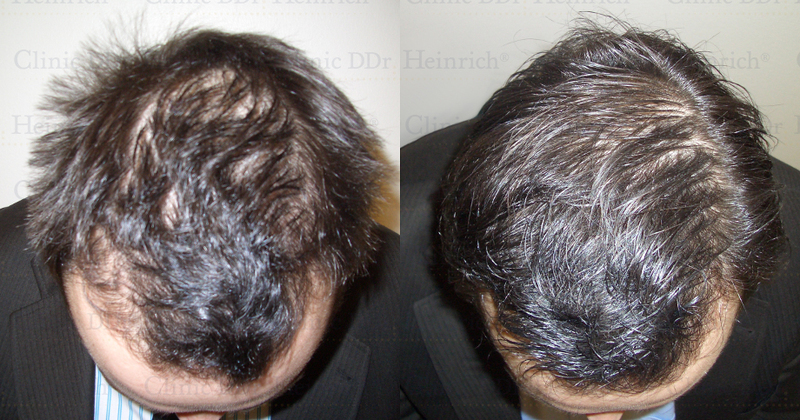 Thinning hair, extensive hair loss, or alopecia (circular hair loss) may also be explained by illness or age. It is our task to determine why the body is aging ahead of time and furthermore to work against the degenerative aging processes in order to eliminate their unwelcome consequences. All our treatments are focused on rejuvenating by using the potential of the body’s own components. We especially use the impressive regenerative power of stem cells from body fat and growth factors found in the blood. Bioidentical hormones, which are structurally identical to natural hormones, support your body by rebuilding a stable hormonal balance, which is important for the bodily systems to function. Thanks Dr. Heinrich, I again like to look in the mirror! We offer promising therapies with stem cells and growth factors both for regeneration of skin as well as hair. Hormone deficiencies are often the reason for unwelcome changes of the body. In most cases invasive surgical interventions such as facelifts and eyelid corrections, removing excess tissue, and hair transplants are not suitable. Instead it is more important to treat the cause of these issues and regenerate the underlying tissue and skin to gently replenish its volume. We are strictly opposed to synthetic fillers (e.g., silicone, hyaluronic acid) since those kinds of therapies are solely used to improve the visible symptoms without having a regenerative effect and without treating the actual cause.